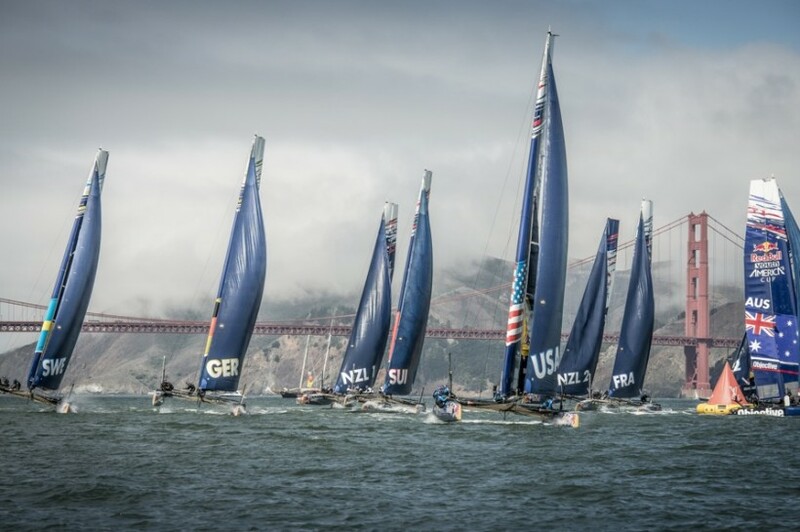 The young Swiss sailors onboard Team Tilt were unable to repeat yesterday’s excellent performance on San Francisco Bay finishing the day with a ninth and a seventh place. But all is not over, with a day to go and two races ahead, Team Tilt will be eying the double points finale to regain position on the leaderboard. Despite excellent starts and good crew work on day three of the Red Bull Youth America’s Cup, success eluded the Team Tilt sailors. A tactical error in the first race and several penalties saw them finish ninth and seventh putting them in sixth place overall going into the final day of racing. Race one saw Team Tilt gybe first at the first mark, a decision that put them at the back of the fleet. Race two started off better, but the team received another penalty before becoming caught up in the Next World Energy code zero halyard which went under the Swiss boat – Team Tilt called for redress. At the close of day three, just nine points stand between Team Tilt and second placed Full Metal Jacket Racing. NZL Sailing Team with Emirates Team New Zealand won two races today which sets them 17 points ahead of second place. The final race tomorrow, race eight of the Red Bull Youth America’s Cup, counts for double points. Team Tilt will be aiming to neutralise any errors and achieve its goal of stepping onto the podium.